DALLAS, Jan. 25, 2017 /PRNewswire/ -- In an age where technology is king, 55% of singles feel that technology has made it more difficult to connect with others in real life. Match, the world's largest dating site, wants to reverse this trend by harnessing technology to do what people want to do naturally—meet in real life. 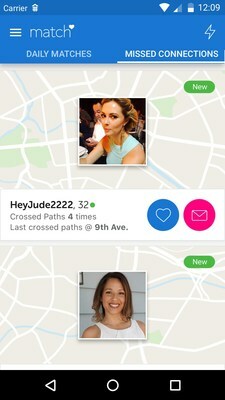 Today, Match is introducing Missed Connections, a new location-based feature on the Match app that allows users to see other members they have crossed paths with in real life. The feature builds off of Match's robust, sophisticated matching algorithms that help singles connect in a meaningful way. 1. 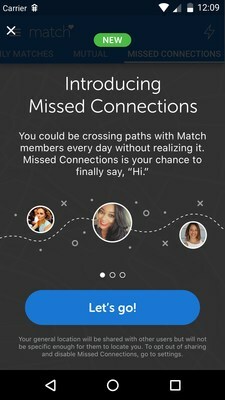 Beginning today, Match members will see a Missed Connections introduction page in the app, showing off the feature and asking members to opt-in. 2. Once you've opted in, you'll be able to browse through your recent feed of members you've crossed paths with, based on your current matching criteria and your location. 3. 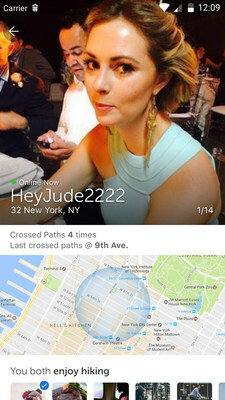 Missed Connections now makes it easy to start up a conversation, right within the feed, providing a natural alibi to connect with someone else. Be sure to check out Missed Connections by logging into the Match app on your iPhone or Android device or downloading the app here.